I've seen pull type versions that were basically three point hitch models with the hitch removed and a tongue added. It also had two tail wheels on each corner instead of one in the middle. That would work too, but my friend was describing straight bars welded on going to where the draw bar bolts on and actually able to use rear lift to pick up the bush hog. But if I can't figure out how that's done I may try the two wheel make it a pull type hooked to the draw bar. 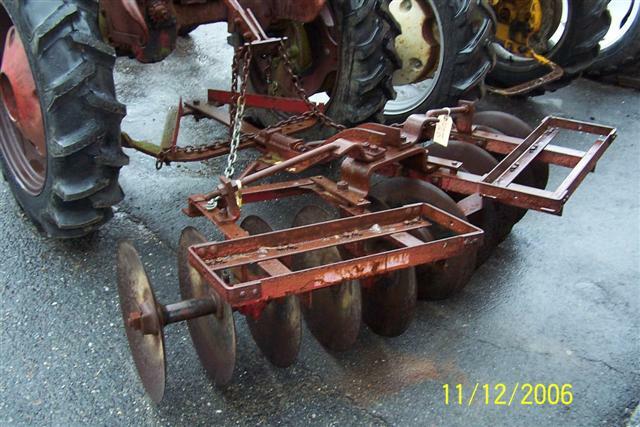 BullDAWG wrote: That would work too, but my friend was describing straight bars welded on going to where the draw bar bolts on and actually able to use rear lift to pick up the bush hog. But if I can't figure out how that's done I may try the two wheel make it a pull type hooked to the draw bar. Also from your original question I wouldn't go wider than a 4' bush hog. If you can find a 1 point fast hitch, that would be the ticket. They make the tractor much more useful with implements like that. Here is a photo of one for sale from craiglist. It is not mine. I have one also. I am going to part this one out (or sell it whole non-working). Let me know if you need anything or are interested in the whole thing.